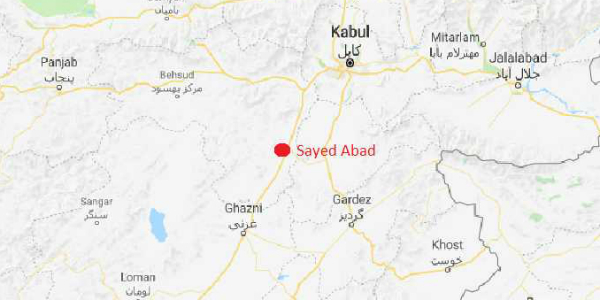 A convoy of military vehicles heading for Ghazni city came under attack in Sayad Abad district in Maidan Wardak at about 5.30pm local time on Sunday. The ambush happened about 80km from Ghazni city. There have so far been no reports of casualties but according to sources clashes between insurgents and security forces from the convoy are ongoing. Paktia borders Ghazni but the direct route has been under Taliban control recently, said a source adding that the convoy was forced to take a long route – through Logar and Wardak provinces – in order to get to Ghazni. The main highway through Ghazni, the Kabul-Kandahar highway – has also been closed to traffic by the Taliban for days – which has affected hundreds of motorists. The Paktia convoy is not however the only convoy on its way to Ghazni. Another convoy of Afghan security forces and foreign troops left Kabul on Sunday afternoon for the embattled city. With no clear channels of communication open with officials in Ghazni, social media has on Sunday carried countless reports of the perceived situation. However, dispelling all rumors, officials have made it clear that the Taliban are not in control of the city nor are they in control of any government facilities. On Sunday evening, Resolute Support’s Public Affairs Officer Lt. Colonel Martin O’Donnell also said Ghazni was under the control of the Afghan government. He said: "The Afghan National Army strongly and swiftly reinforced Ghazni City after Afghan security thwarted Friday's Taliban attack. The city was relatively quiet Friday evening and people were observed moving freely on the streets. That said, clearing operations are ongoing and sporadic clashes are occurring. “What we are seeing as the clearing operations continue is the Taliban attempting to harass Afghan forces and using civilians, who they show little regards toward, as cover. “In addition to the initial strike, close-air support and B-1 show of presence on Friday, US forces conducted five strikes yesterday (Saturday) and 10 thus far today. The Afghan National Defense and Security Forces continue to hold their ground and maintain control of all government centers,” he said. He said: “The fact remains that the Taliban are unable to seize terrain and unable to match the Afghan security forces or our enablement, retreating once directly and decisively engaged." The Afghan National Army’s 203 Corps spokesman Maj. Mohammad Farooq meanwhile said: "The city is under the complete control of Afghan security forces. Afghan National Army reinforcements have made their way to Ghazni city to help the Afghan National Police search and clear the city of insurgents that may still be hiding in the city." However, communication lines with the city have been disconnected for about three days and little information has been gleaned in the time. The Provincial Police Chief Farid Ahmad Mashal also told TOLOnews on Sunday afternoon that no government facilities in the city had fallen to the Taliban. He said however that foreign fighters, including Pakistanis and Chechens, are involved in the battle for Ghazni. Clearance operations are underway and house-to-house searches are being conducted, he said. Insecurity recently increased dramatically in Ghazni province, which led to the Independent Election Commission delaying parliamentary elections in the province. Sources said the convoy, from Paktia, came under attack at 5.30pm local time about 80kms from its destination – Ghazni city.